An innocent country lad from the Fens goes to London where he earns the love and respect of a nation as one of its most influential figures. But his strong principles run against the grain of the culture and, in standing up for them, he becomes isolated, ridiculed by the media - and broken-hearted. This powerful, inspirational drama documentary goes beyond the text of the book to faithfully recreate the times of C.H. Spurgeon and bring the 'people's preacher' to life. Made by the award-winning Christian Television Association, and filmed on location in England, Scotland, France and Germany, this film vividly captures the spirit and message of a man whose eventful - and sometimes controversial - life is highly relevant to the twenty-first century. Great for watching on your own or in a group. * 'The Making of "The People's Preacher"' (15 mins), a behind-the-scenes documentary. About "C.H. Spurgeon: The People's Preacher"
Customer Reviews For "C.H. 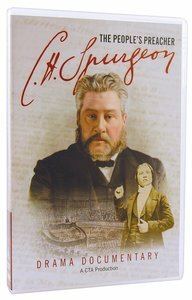 Spurgeon: The People's Preacher"
This is a truly brilliant DVD on one of the giants of the Christian faith. The story is very accurately told in a memorable way. You will want to come back to this DVD for a second or perhaps third viewing.